Take an Advent break and choose from more than 350 city hotels of all standards. No reservation fees. 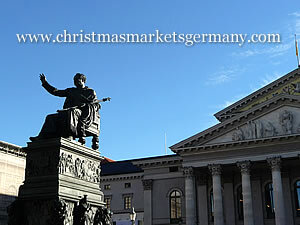 As the centre of the conservative and mainly Catholic state of Bavaria, it is hardly surprising that Munich has one of the oldest and most traditional of Christmas markets. 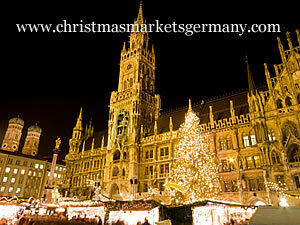 The Christkindlmarkt is held in front of Munich Town Hall in a prime location for the three million visitors in the pedestrian heart of the city. Locals reckon that the roots of the market go back into the 14th century, although it has only been in its present prime position since the 1970s. Although Munich may well be the capital of a conservative state, it is also known for being a rich and trendy cultural hotspot and the mix of of tastes in other markets is an interesting one. Here are some of the city markets which have their own websites. The organisers of this market have recreated a farming village in the Emperor's Court of the Munich Residenz, the former Bavarian seat of government. S chwabing is situated to the north of the city centre and is known as a lively student section of the city, with plenty of bars, nightlife and activity. Take advantage of the city's gardens. It may be getting on for winter and Christmas, but Munich's open spaces are its pride and joy, from the Hofgarten to the Englischer Garten to the gardens at Nymphenburg Castle. Beer. Bavaria is famous for its beer. Munich is the capital of Bavaria and thus has some very fine beer halls. Don't just head for the tourist-infested Hofbräuhaus - try some of the others around the centre. And don't forget the local food, either. Things that turn and whistle and grind. The Deutsches Museum near the centre is one of Europe's finest museums. It specialises in science and technology and you could, as they say, spend days in there. Munich International Airport is located to the northeast of the city just under 30km away from the centre. It is linked by the regional train service to the main railway stations in the city. Munich Hauptbahnhof, the principal railway station in the city, is located to the west of the city centre. There are some other less important rail stations, München Pasing and München Ost, for example, which also link mainline and regional rail services. As well as the useful S-Bahn regional services which go to a number of interesting destinations outside the city centre, Munich has an extensive underground rail system. All the local services, including buses, trams and trains, are integrated into a common ticket service by the MVV (Münchner Verkehrs- und Tarifverbund).